Colin Kaepernick of the San Francisco 49ers speaks to media. Kaepernick recently sparked controversy for kneeling during the national anthem. 28-year-old Colin Kaepernick knelt stone-faced on the sidelines, a chorus of boos showering him from the stands as “The Star Spangled Banner” echoed throughout Qualcomm Stadium during Thursday night’s football game between the San Francisco 49ers and the San Diego Chargers. There are bodies in the street and people getting paid leave and getting away with murder." And while many have criticized Kaepernick, others have praised his actions for bringing attention to an important issue. Kaepernick’s teammate Eric Reid also sat the anthem out last night, as did Seattle Seahawks cornerback Jeremy Lane, who was playing in Oakland. The 49ers have defended their man's right to protest during the anthem. But with some fans threatening boycotts, Kaepernick's struggles at quarterback, and now division on the team, the Niners might decide to cut their losses and cut him. They'd still owe him nearly $12-million this season. But more important than his employment is whether his protest aids his cause. 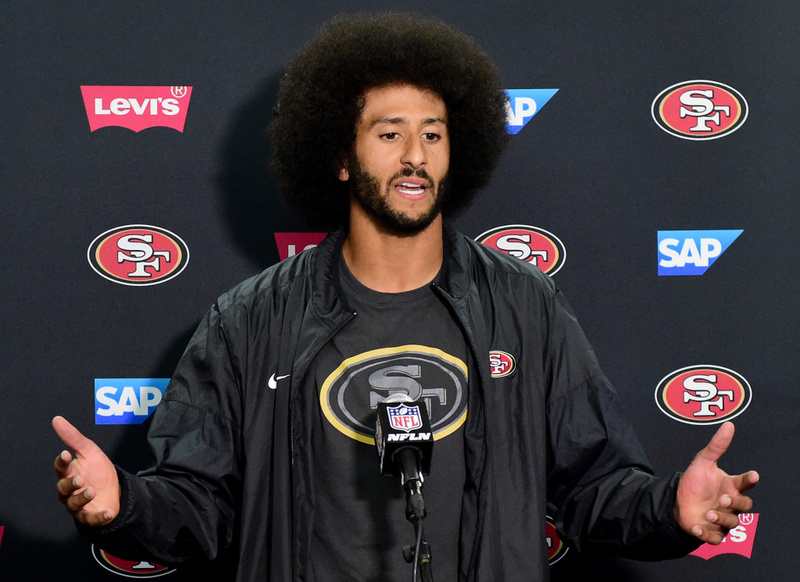 Kaepernick says he'll refrain from standing until changes are made. It's unclear what those changes are, but Kaepernick says he'll donate a million dollars of his salary to community organizations. Do protests by athletes bring social changes? Is the national anthem a good vehicle for expressing discontent? Is it patriotic? If you owned the 49ers, would you be tempted to cut him over the division created on the team, or would you let that work itself out and keep him? Kaepernick refuses to stand for the national anthem --again, regulating advertising on social media & TGI-FilmWeek!